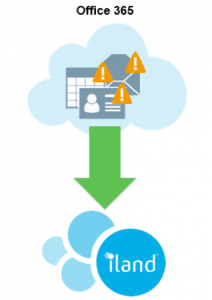 iland Secure Cloud Backup for Microsoft Office 365 with Veeam is an as-a-Service solution that provides complete backup and recovery for your Office 365 Business/Enterprise data including Exchange Online, SharePoint Online and OneDrive for Business. Your Office 365 data is automatically backed up daily to iland’s secure cloud. Microsoft Office 365 is a robust cloud based offering. However, Microsoft’s primary focus is to manage the infrastructure and uptime of Office 365 while leaving the protection and long-term retention of the data to be the customer’s responsibility.